"Rescue Me" is the 2nd book in the Montana Rescue series. The characters and stories are very intertwined between the stories, so it is best to read the books in order. 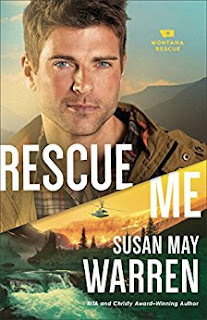 Like Susan May Warren's other books, this one had a main plot with Sam Brooks and Willow Rose, but also a secondary plot with Pete Brooks and Jess Tagg (albeit not brought to a conclusion). The book was real and open and gripping. I picked up the book and everything else was put on hold. All I wanted to do was read. And then when it was done, to read more. Thankfully there are two more books in the series, with more to come. Faith was woven easily throughout the story. I think the reader as well as the characters in the book learn a great deal from the truths shared.